For the first time in many years, this month the U.S. government plans to capture nearly 1,000 federally protected wild horses in Devil’s Garden Plateau, a 258,000-acre area inside Northern California’s Modoc National Forest. This is the largest herd of wild horses in the United States. The US Forest Service, which manages the land, initiated what it’s calling the “horse gather” because it says the animals have exceeded their population limit. 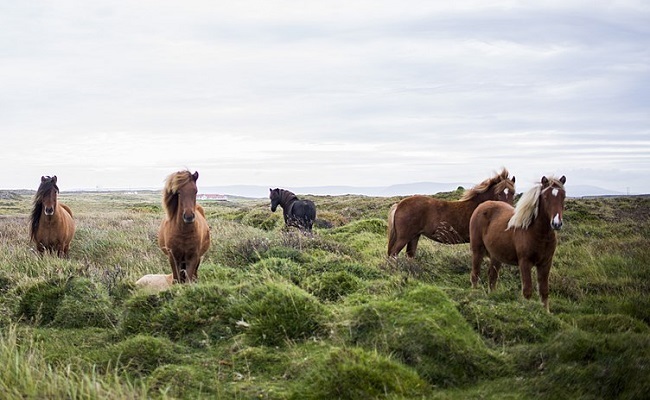 There are currently about 3,900 horses living in an area meant to accommodate up to 400 of the animals. The horses are consuming vegetation and water, leaving little for other wild animals, according to a statement from Modoc National Forest Supervisor Amanda McAdams. About 700 of the wild horses to be captured are either pregnant or under 10 years old. They will be sent to a Bureau of Land Management (BLM) adoption facility and will hopefully find new homes. But the remaining 300 or so horses will be offered for sale at a temporary holding facility. The ones that are still there after 30 days will be sold for just a dollar each. Animal welfare organizations including the Humane Society of the United States (HSUS) and the American Wild Horse Campaign (AWHC), along with Sen. Dianne Feinstein, oppose the roundup. They are rightfully concerned that buyers of the $1 horses will ship them off to slaughterhouses in Canada and Mexico. In an Oct. 9 letter to acting Forest Service Chief Vicki Christiansen, Feinstein requested the “horse gather” be halted until the chief could answer some important questions: how was the wild horse population determined? How will the safety of the horses be ensured when they’re captured? How will the Forest Service help the horses find new homes? Can Christiansen certify that none of the horses will be sold to slaughterhouse buyers? The Forest Service is taking advantage of a legal loophole that could result in the slaughter of the horses, according to the AWHC. Unlike the BLM, the Forest Service is not prohibited from selling wild horses for slaughter. Previous administrations have followed the BLM rules — but not the current one, which is “radically changing the policy,” the AWHC says. The real reason for the “horse gather,” according to the AWHC, is to replace the wild horses with cattle belonging to ranchers who pay the government a fee for grazing permits. As a better alternative, the AWHC urged the Forest Service to remove the herd in smaller increments to assure they can be humanely re-homed. This is not possible, Modoc County Farm Advisor Laura Snell argued, because with a population growth of up to 25 percent, as many as 1,000 wild horses would be born on the Devil’s Garden this year. Another way to manage the population growth is to use an immunocontraceptive vaccine on mares. “The vaccine can be delivered remotely via darting, or by hand injection after horses have been humanely gathered via bait trapping,” the AWHC notes. It has no effect on the fetuses of pregnant mares and doesn’t impact hormones that drive natural behaviors. Reducing the wild horse population via sterilization, however, is not a humane option. Doing so “takes the wild out of wild horses by destroying the wild free-roaming behaviors that distinguish wild horses from their domestic counterparts,” says the AWHC. Spaying mares is an especially dangerous procedure. The AWHC and other animal welfare groups are currently suing the the BLM for performing cruel sterilization surgeries on wild mares in Oregon. In October 2016, the HSUS warned that a Trump presidency would be “a threat to animals everywhere.” Sadly, two years later, the “horse gather” in California is just one more example of how this prediction has come true. For information about adopting one of these or other captured wild horses, go to the BLM’s Wild Horse and Burro Online Corral website. Ditto to Mark Donner's comment! Is there anything the Governor of California can do provided he or she isn't a republican siding with #notmypresident trump? Prayers rising for all America's wild horses to be protected and saved for all time, allowing them their freedom while also being monitored for their health and well being. Forest Service is one of those renegade criminal government agencies whose real agenda is the exact opposite of what they supposedly represent. They exist to destroy forests for ranchers and loggers and they criminals receiving kickbacks. Wildlife Services and Fish and Wildlife exist to destroy wildlife, BLM exists to destroy public lands, EPA exists to destroy the environment. These renegades must be dealt with as criminal organizations and enemies of Americans. This article made me nauseous. How in the world could they think that these horses would be in safe hands after Captor. Those that aren't sold will be sold for a dollar a dollar goes a long way when it comes to making cans of dog food give me a break.